Having read many successful stories in International Living magazine over the years about people seeking a better life while living abroad, my partner, Damon, and I chose to throw our hat in the ring and see if the life of roving retirees was for us. We set ourselves a budget of $1,800 a month to see if it was possible to establish a life of nomadic adventurers while living abroad. We sold everything and didn’t look back. We set off on the first leg our adventure with just two backpacks each and a one-way ticket to our first chosen destination in the lush and jungled landscape of Costa Rica. We landed in the small community of Nuevo Arenal (a population of roughly 2,500 people) which is nestled into the hillside of Lake Arenal. We found a wonderful two-bedroom apartment through Airbnb for the amazingly low price of $560 a month (including all utilities and internet), and we quickly settled in to a three-month stay. We discovered friendly locals and a large and welcoming expat community, and right away we felt like we were home. Whether shopping at the local markets, or traveling to the local farmer’s market, we were always offered an abundant variety of the freshest fruits and vegetables at prices that we would never find back home in the States. Our monthly food bill ran about $350 a month, and that included dinners out almost every other night. And with the huge variety of eco-activities such as swimming at the sun-drenched beaches of Manuel Antonio, taking a jungle cruise, or exploring the volcanic region of La Fortuna, there was never a shortage of fun outdoor activities to choose from, all at very affordable prices. Before we knew it, our third month came to an end. We had successfully stayed within our budget, so we were more motivated than ever to continue our journey. We turned our sights next to the quaint and beautiful town of Antigua, Guatemala. Antigua is a beautiful colonial town with an amazing population of people. We were made to feel at home right away. We found a charming colonial apartment through Airbnb for only $750 a month. This apartment was in a beautifully maintained gated community within walking distance to the action of downtown Antigua. Again, all our utilities and internet were included in the price. Our food bill ran us about $400 a month, including meals at some of the best restaurants we encountered while living abroad. If you are a foodie, then Antigua will have some fantastic restaurants for you to choose from. And if adventures in the great outdoors are what you’re looking for, then I’d recommend taking a walking tour through one of the many coffee plantations, boating on beautiful Lake Atitlan, or exploring the ancient ruins of Tikal. You’re bound to make memories in Guatemala that will last you a lifetime. It seemed that we no sooner started our Guatemala adventure when we found ourselves at the end of our two-month stay. Again, we were successful in staying within our budget. Sad to leave, but excited to continue on our journey as roving retirees, we booked our next stop in the big and bustling city of Medellín, Colombia. This city is rich in culture and steeped in history. From its many art museums such as the Museum of Antioquia in downtown Medellín, to the colorful wall murals of Comunal 13, you will find yourself surrounded by artworks created by local artists. If you are a shopper, then Medellin has some of the world’s most beautiful malls to offer. The Centro Comercial Santefé is an incredible mall that offers a shopping experience that rivals New York, San Francisco, or Los Angeles. Great restaurants abound in the city, and eating out is always a treat when you are only spending half of what you would have back home. Mix that with the $750 rent (including all the utilities and internet) and you have a lifestyle that was well within our budgeted amount. Continuing on our South American trajectory we are currently living in the historical district of Cuenca, Ecuador. 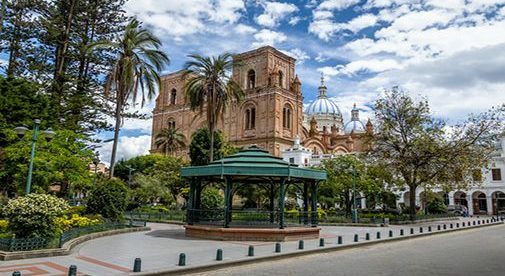 Cuenca’s a beautiful and busy city, and the colonial architecture and cobblestone streets make its El Centro district a huge draw for locals, expats, and tourist alike. Cuenca’s El Centro district is like stepping back in time to a slower way of life, yet with the creature comforts of the modern day. Families spend time together while holding hands and walking through Parque Calderon enjoying ice cream. We have found the prices in Cuenca to be the best we’ve seen on our journey thus far. Head to one of the many restaurants within walking distance and enjoy a filling lunch of soup, a main course of either meat, chicken or pork, along with rice, salad, a side dish, and usually some type of fresh-squeezed juice, all for the unbelievable price of $2 per person. Or walk to the local farmer’s market and pick up a bounty of veggies for around $12. You have plenty of places that are all within walking distance, however, you can take the city bus for a quarter, or if you want to take a cab, be prepared to fork over a whopping $2 to $3 to get to your destination. Apartments can go from $350 to $700 a month, fully-furnished. We’ve found Cuenca to be the perfect place to rest our heads for the time being, but we’ll be up and off again before we know it. Who says the life of a retiree has to be slow-paced and boring? We’re having the time of our lives, and we don’t see any sign of slowing down.